I hope you will enjoy a peek at my latest thrifty finds. 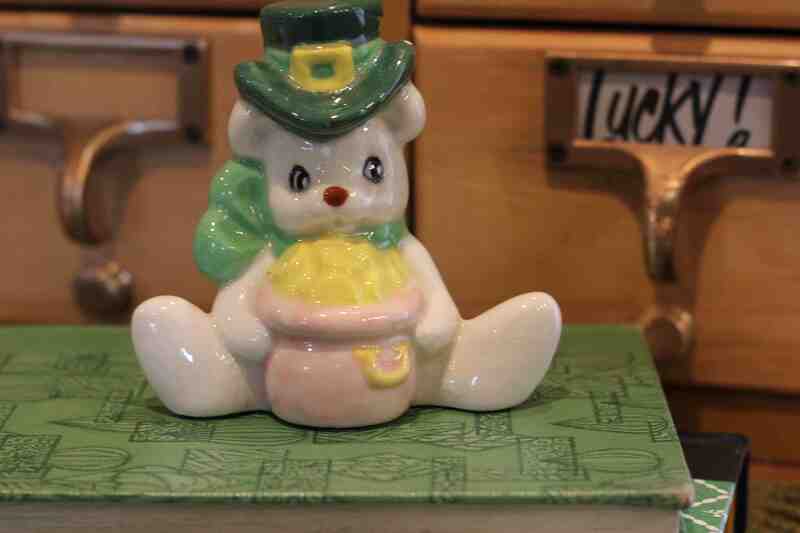 I don’t often see cute, vintage St. Patrick’s Day treasures, so this was a true “pot-of-gold” that made my day. I also love to gather up vintage books with retro graphics such as this little story-book and the Reader’s Digest Condensed edition peeking out from below. They are so much fun to use in decorating because of their great colors and patterns. St. Patrick’s Day is about celebrating a few little fun things: a bright-green scarf, a tasty plate of corned-beef and cabbage, and perhaps the lucky little “pots-of-gold” in your life: a cozy home, a shelf full of good books, a hot mug of tea and a faithful companion with whom to share the blessings. Wishing you nothing but luck this week and all the year through. That is such a cute find. Do I see an old library drawer in the background? I love it! I love simple holidays like St. Pat’s Day, thanks for reminding me to pick up little treasures when I am out and about.